Since Noah’s actual birthday was on a weekday, we elected to celebrate on the following weekend with a real party. 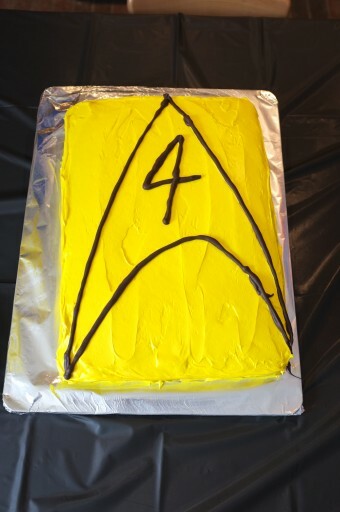 He had requested a Star Trek party, so we boarded the Starship Enterprise for a celebration. As I was planning the party, I did some searching on the web and Pinterest for ideas, but didn’t find much off-the-shelf party stuff. 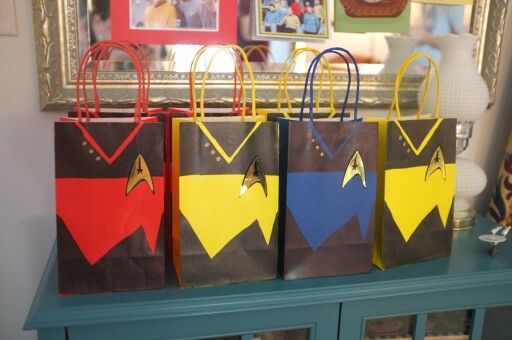 I loved this post of kid party ideas but found lots of stuff for adults, too. 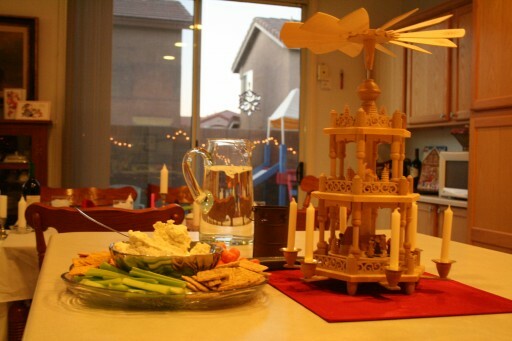 We were going for a smaller-scale party and didn’t plan too much in the way of decor. 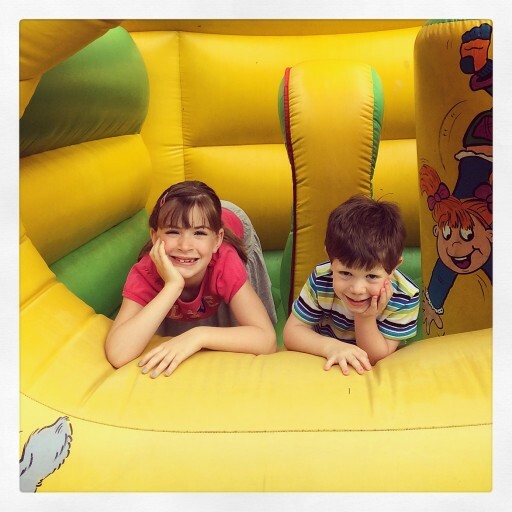 Mostly, the kids wanted to bounce in a bouncehouse, so we rented one from the base like we did last year. This time, we got one with obstacles in the middle so they could “explore” the alien planet with less gravity than we have here on Earth. 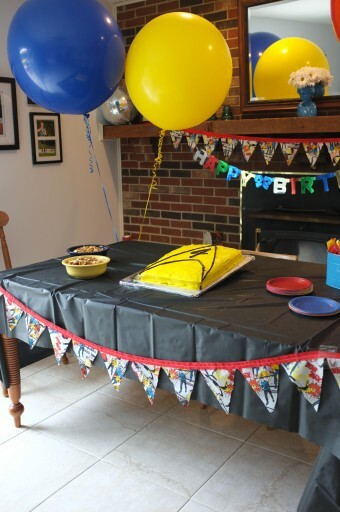 For decorations, we hung our standard birthday banners, some new Star Trek fabric banners, the big 36″ balloons (Noah named them Kirk, Spock and Scotty) and that was about it. Noah really wanted me to hang up curtains into the dining room so that he could pretend it was the Enterprise and make the “swoosh” sound when he walked through. I couldn’t find the curtains we had used for Ava’s party, though, so he had to make the sound without the visual effect. It ended up ok anyway. Since we had a small group here for the party, we did things backward. Cake and ice cream first, then presents, and then lots of bouncing. That gave us adults time to fix dinner before the kids were hungry and also gave them an outlet for all that sugar. It worked out so well that we might do it that way from now on. Reverse birthday parties rock! 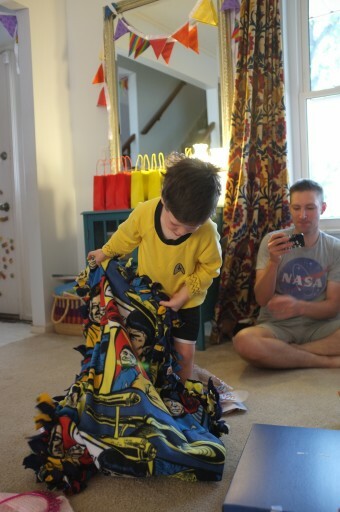 Ava made Noah a fleece Star Trek blanket as a gift. 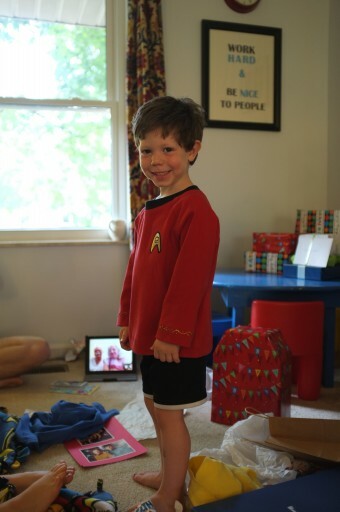 Grama made Noah a whole set of Star Trek shirts – Kirk, Spock & Scotty – and they get worn every day they are clean. 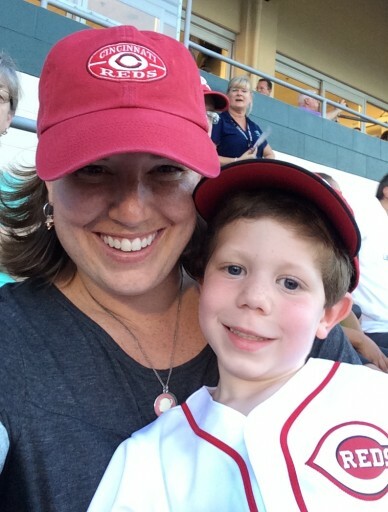 On the other days, he wears his Reds gear. 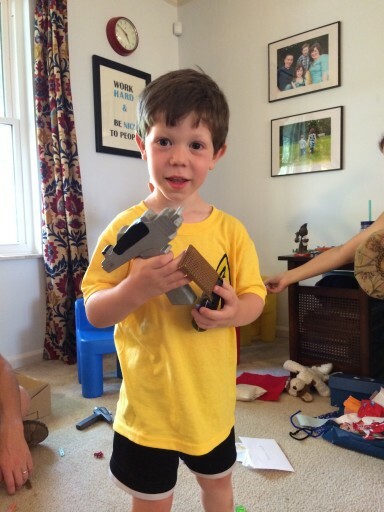 In addition to the costumes, Gramma and Grampa send some of Matt’s old Star Trek toys our way. The transporter room and shuttle craft were huge hits (with both the big and small Trekkies in the house). 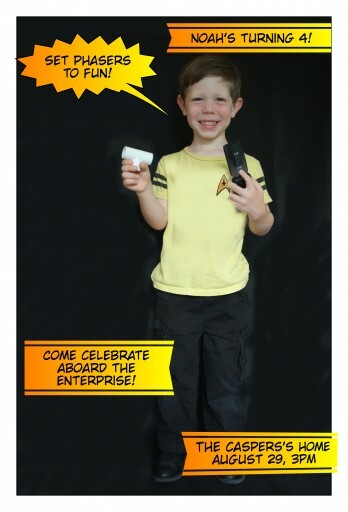 To stick with the theme, Noah received a full armory of phasers. Matt made him three (a real one and two prototypes) and Uncle Michael made two as well. Once he had opened his communicator from Auntie Brooke and a model Enterprise from us, he was a real-life space voyager. Auntie Moe scored an awesome sound machine that makes the “swoosh” door sound when you walk by it, so he has one less doorway to make the sound himself when he walks by. We hung it in the doorway between the playroom and the kitchen so we get to hear it a LOT. 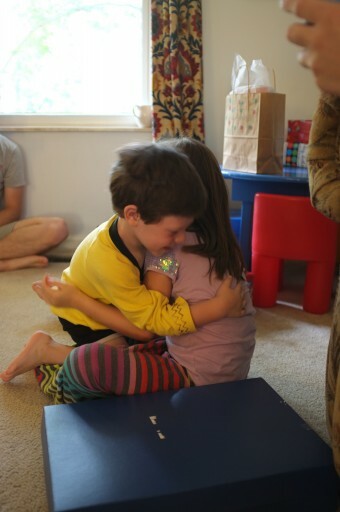 After presents, the kids bounced while we made hamburgers and then we all shared a meal together. Image re-creation from last year’s bounce house. 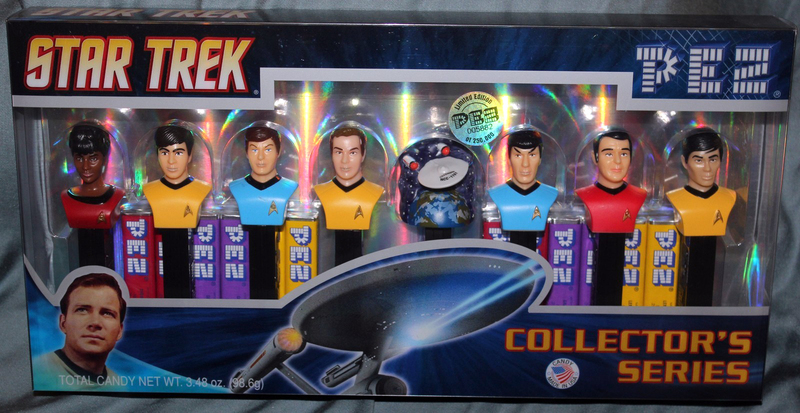 We sent everyone home with their own Star Trek command badge, a phaser, and an TOS Pez dispenser. 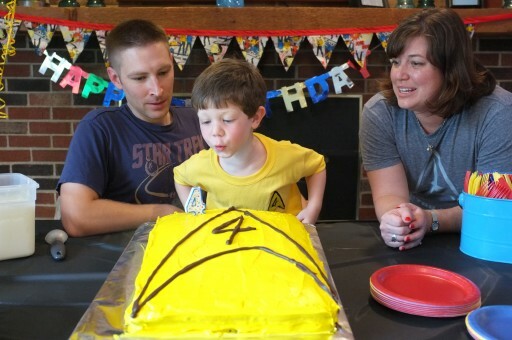 All in all, I think Noah had a great time and we have 1000% more Star Trek stuff in our house. We got to keep the bounce house through the long Labor Day weekend, so we enjoyed it for several hours in spite of the sporadic rain. Now that the party is over, we play Star Trek daily but, since we can’t play baseball all winter, it’s sort of nice to have a go-to indoor game to play for the quickly approaching Ohio winter. Live long and prosper, Noah! 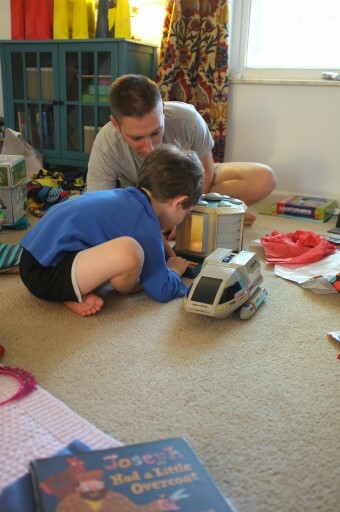 Noah’s birthday this year was on a Wednesday, which meant that school and work were non-negotiable. Plus, Matt was away TDY, so we were celebrating as a group of three rather than four. His party was planned for the following weekend, but I still wanted to mark the actual day with some fun. So, Ava and I took our guy out for a fun evening and kicked off his celebration as we picked him up from school. 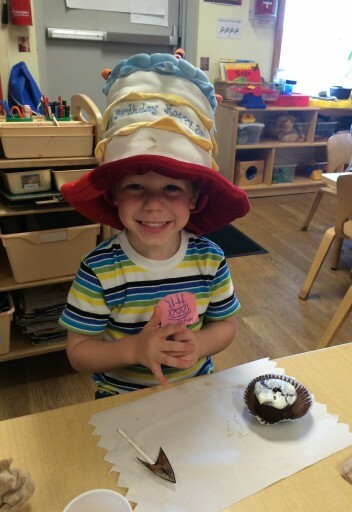 We started, of course, with cupcake delivery for snack time in his classroom. He had been wearing that big, goofy hat all day and LOVING it. We served chocolate cupcakes with vanilla frosting (his request) and topped them with Star Trek command badges. Noah loved hearing his class sing him “Happy Birthday” and we apologized profusely to Ms Donna for leaving her with a classroom full of sugared up kiddos. When we got home, we opened a couple of small gifts (because what good is a birthday without presents, right?) and Skyped with Grammie. Our gift to Noah was a set of tickets to a Dragons baseball game that night. 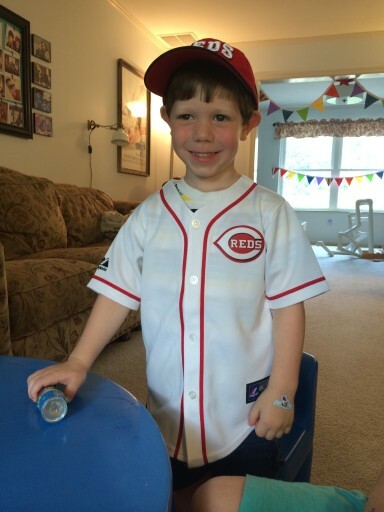 His gift from Grammie and Grandad paired nicely with ours and he was soon all geared up to go to the ball field. After we answered numerous phone calls, we headed out the door to dinner. Noah picked his favorite place and we yummied on burgers at Five Guys. We headed downtown and to the ballpark after that. 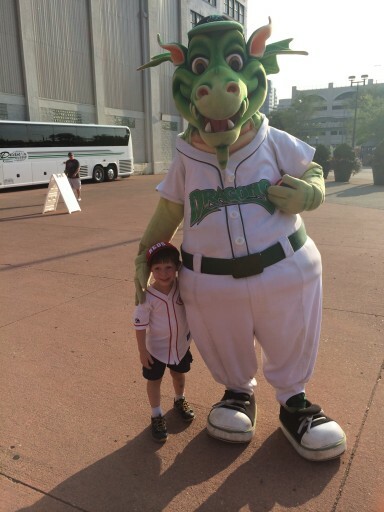 Heater (the Dragons mascot) always hangs out in the plaza in front of the gates before the games, so Noah immediately ran over to say hi. 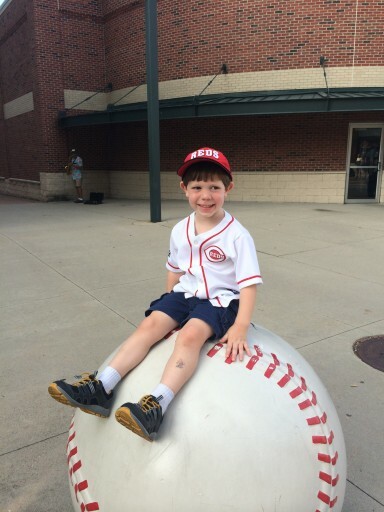 He LOVES mascots (#minorleagueheroes) and always scores a photo op with them at the ballpark. When Noah told Heater that it was his birthday, he got the royal treatment. The whole Green Team swarmed and he was treated to a special birthday song, lots of laughs and some fancy balloons. It’s hard to tell from the video, but his first balloon sword totally deflated mid-song. If you know Noah, you also know that such an occurrence could have put him into a major funk. But, the Green Team magic was at work and kept him in a comical mood. 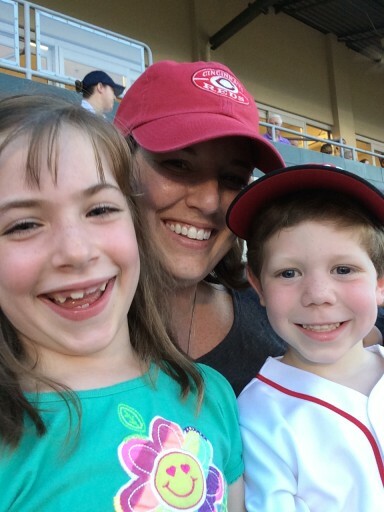 The team was cracking up and, when they were done singing, Noah said, “I did not see that coming!” With a new sword in hand for Noah and a green kitty for Ava, we finally went in to watch some baseball. 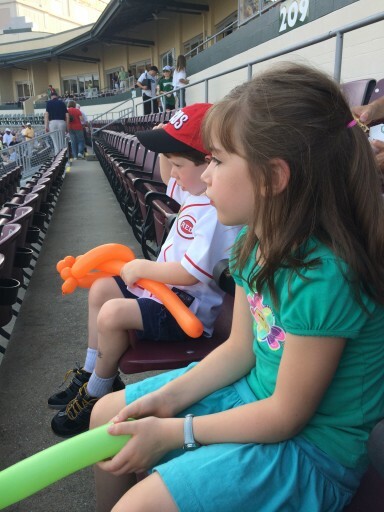 The kids were SO good for the whole game and were respectful of their neighbors with their balloons. In fact, the man behind me tapped me on the shoulder in about the 5th inning and said, “Relax! They’re doing really well. You should be so proud of how they’re behaving.” So I did and I was. The game started at 7pm, which is about 15 minutes before bedtime around here, and we left after the 7th inning stretch because it was a school night. BUT, Noah and I were up on the big screen while we sang “Take Me Out to the Ballgame” so I think that was pretty much the high note to leave on anyway. There are two things that are absolutely always true about Noah – he loves baseball and Star Trek in equal measures and with his whole heart. 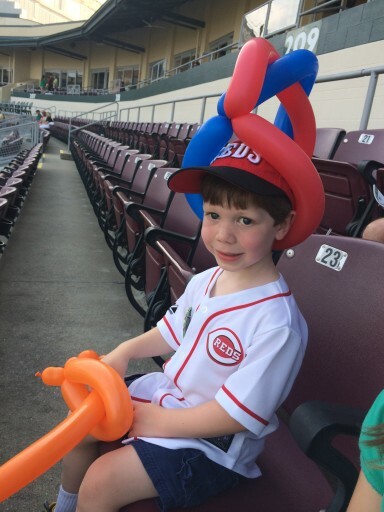 Since we’d be enjoying his other passion for his party, it made good sense to celebrate baseball for his big day. We couldn’t love our little baseball man more and love watching him grow up. 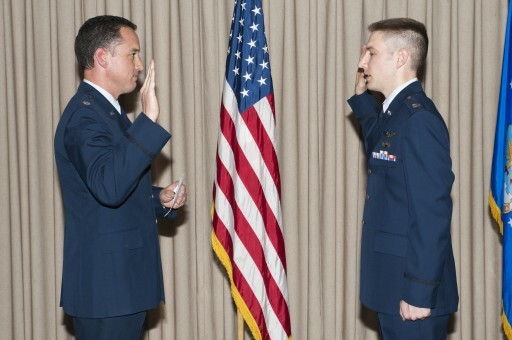 To one of the US Air Force’s newest Majors. 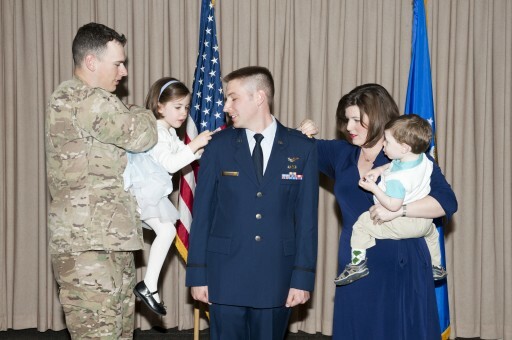 Thanks for your service, Matt, we’re all so proud of you. 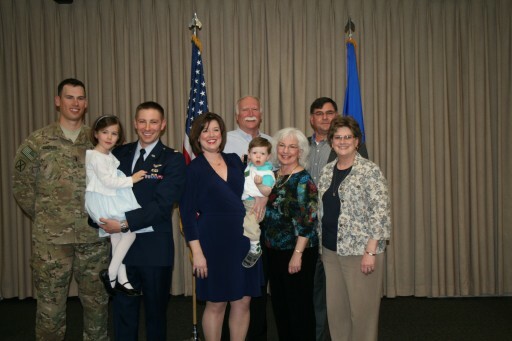 Such a treat to have so much family in town to celebrate! We got to enjoy another wonderful Christmas Eve with the Hoffmans, as is tradition around here. We got all dressed up, set a fancy table and enjoyed a fabulous dinner of steak, twice-baked potatoes, and green bean casserole. Lighting the Christmas Eve carousel. 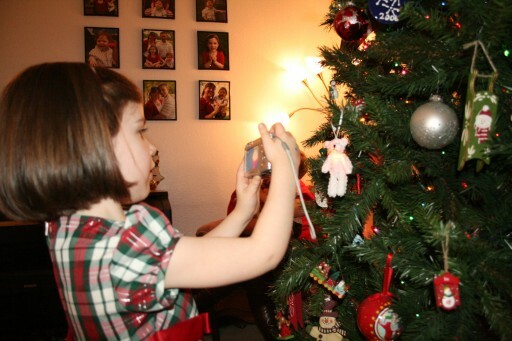 Making sure we get lots of pictures of the ornaments. It’s tradition! 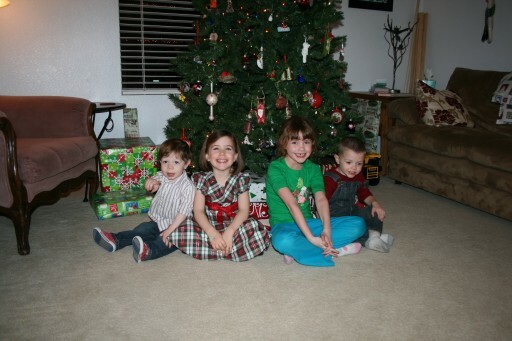 Caspers Kids and Hoffman Kids (2010, 2009). 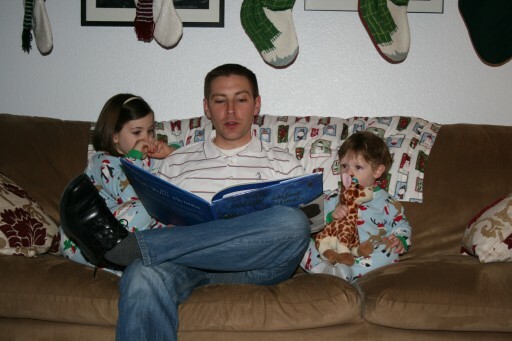 Reading “Twas the Night Before Christmas” and then they all went to sleep! Ready for a happy Christmas tomorrow morning! So glad we’ve had such a fun Christmas Eve tradition here in Vegas. 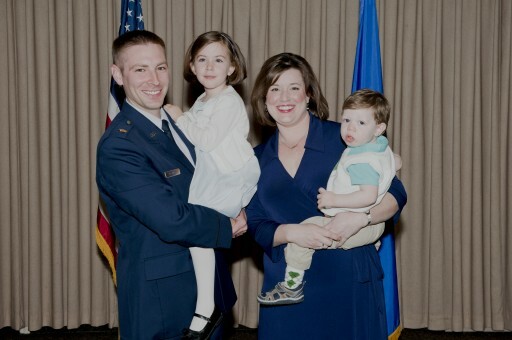 Thanks for a great night, Hoffman family, and a great four years! We love our kids’ school for a lot of reasons, but one of them is that they throw big holiday parties and invite all the families in. I remember that it was always so fun to be in my school “off duty” when I was a kid and so I’m glad our kids get that chance here too. 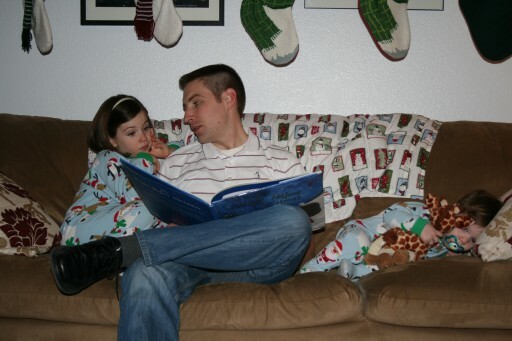 The Friday of Winter Festival is also a school-wide pajama day, so the kids went to school in jammies and parents are invited to wear jammies for the festival. 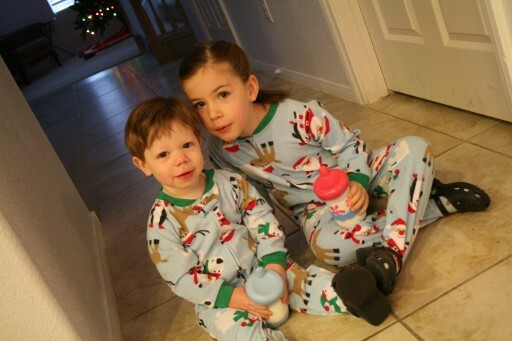 These two were so cute, it just made my heart ache that day! At our school, each of the classrooms is open with a fun activity or project for the kids to do and there are decorations and snacks throughout the hallways. 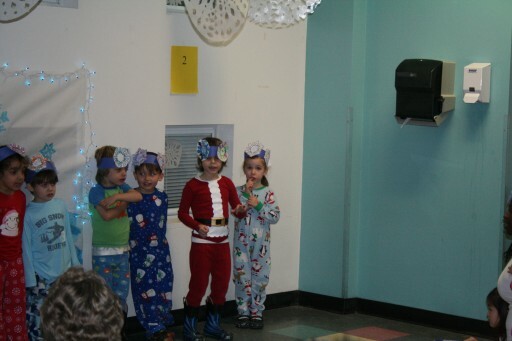 But the main event is that each of the classes in the school practices a song or poem for weeks in advance and then does a little performance for the families at Winter Festival. I’m so grateful for this school because they’re so fun! 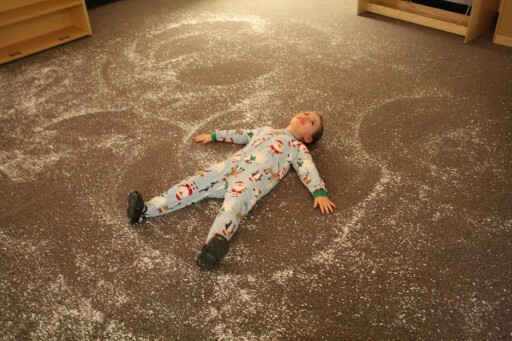 I can’t imagine opening a whole classroom, filling it with sparkle paper and glitter and then inviting kids in to go nuts. Can you imagine the mess? But, no kidding, on Monday morning, you’d have never even known it happened. Talk about extra effort for the good of the kiddos. 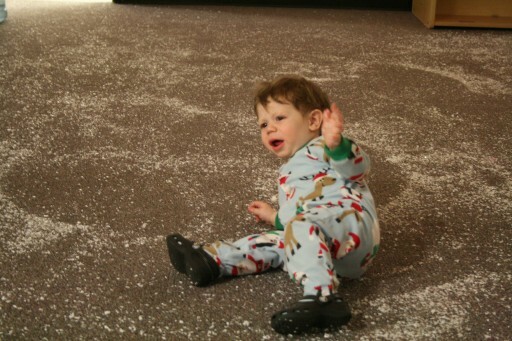 Noah wasn’t so sure glitter snow angels were awesome. The babies and toddlers videotape their performances and we get to watch the movie on the big night since there’s no way they’ll perform for a big group on demand. But, the bigger kids all do a little show and it’s super cute. 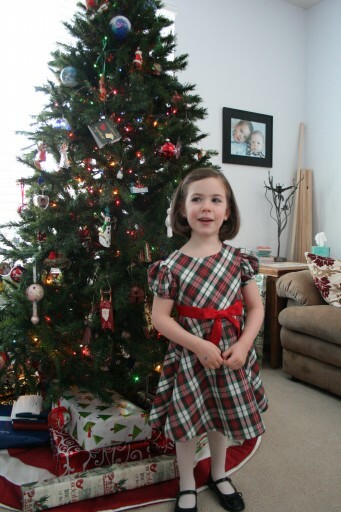 Ava’s class performed the poem “Falling Snow” and then sang “Jingle Bells.” We got an advance preview of her performance at home before we left for the party. Ava was pretending to be shy when it was her group’s turn to perform and we’re not really sure why. We know she knew her stuff and she’s quite the ham, so that will probably always be a mystery. 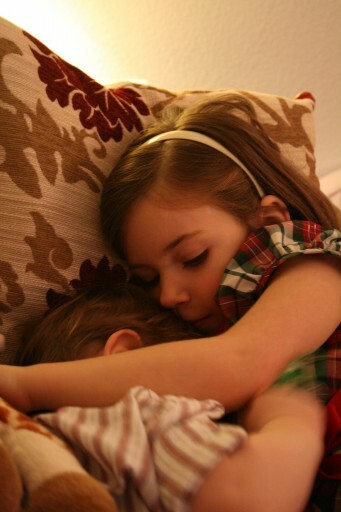 Regardless, we sure had a fun time and all those cute performances sure made up for the sugar crash the next day! © Copyright 2019. Oh-Bla-Di. All Rights Reserved.